Review: Pillow Pets The Ultimate Cuddly Toy, That's A Cushion! Home Uncategorized Review: Pillow Pets The Ultimate Cuddly Toy, That’s A Cushion! Review: Pillow Pets The Ultimate Cuddly Toy, That’s A Cushion! If your child is anything like mine then their bedroom will be filled with cuddly bears but mostly their bed will be too! Liv must definitely take after me as my bed was always filled with teddies but at least I could move. How Liv can actually fit in her bed I shall never know but heaven forbid if you try and take any bears out of her bed to make space, she even makes sure they are tucked up at night. Very cute, but can also make bedtime a long process! For a couple of months now Liv has been cuddling up to the very aptly named “Penguin” when she falls asleep. Penguin is actually a Penguin Pillow Pet and is adorably soft and cuddly. You may well be aware of the catchy advert “It’s a Pillow, it’s a Pet, it’s a Pillow Pet!” Pillow Pets are exactly that. A cuddly teddy that unfolds into a pillow on which your child can rest their head. Perfect for lazy days on the sofa or whenever your child feels a little tired, simply unfasten the velcro strip underneath the character belly and the Pillow Pet stretches out to a reasonable 18″ square shaped cushion that is comfy to lie on. The Pillow Pets range is absolutely vast so you will no doubt find the perfect character for your child. 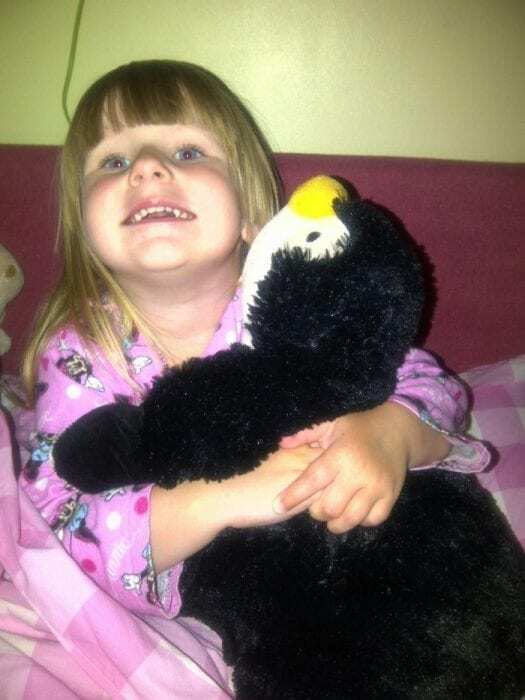 With animals such as the Penguin, Unicorn and Puppy (to name a few) to choose from all the Pillow Pets cushions are colourful, comfy and most importantly, machine washable! I was a little wary of the velcro strip at first as I find when velcro is washed it can lose the ability to fasten properly. Though after a couple of month’s usage and several washes, it still attaches well and there is also a little strip of fabric that covers the velcro when not in use, a genius feature that I appreciate. You can purchase Pillow Pets directly from their official website priced at £14.99 which I find very reasonable considering the high quality of the cushion. It definitely makes a great present idea and I know that when Liv and I go off on our travels “Penguin” will be coming along with us to make the journey a little more comfortable.